Hitohiro Saito was born in 1957 in Iwama. At the age of seven, he began training under O-sensei. After Ueshiba died in 1969, he continued his practice with his father. In 1986 he became a teacher at Iwama dojo where he had substituted his father in his absence. He still continued to teach at his dojo in Tokio. 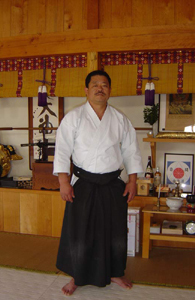 After his father's passing away in 2002 he set up a new organization Iwama Shin Shin Aiki Shurenkai to persevere in spiritual and technical tradition as it had been taught by O-sensei and his father. Currently, Tanrenkan dojo is one the few Japanese dojos that continue in the tradition of uchideshi program in which a student lives in sensei's house and who trains under and assists a sensei, on a full-time basis.